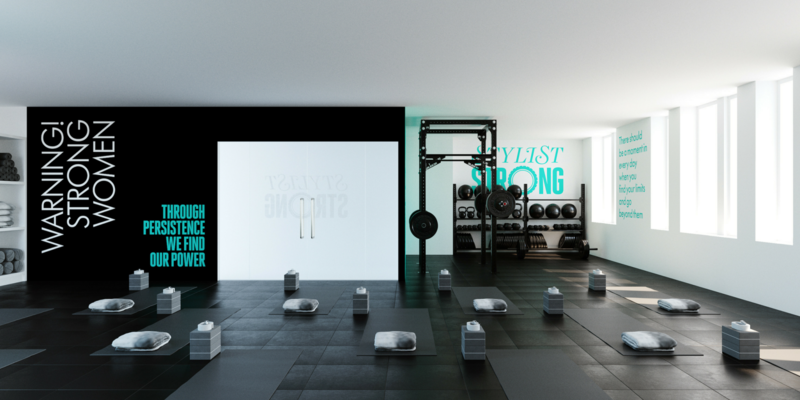 LONDON, United Kingdom — The Stylist Group; a British-based publisher which owns Stylist and Emerald Street, has announced the launch of a women’s fitness studio and brand aimed at extending its experience offering. The Stylist Strong studio, a boutique fitness space which the brand says will offer smart, class-based workouts for busy women who are interested in building their physical and mental strength, will feature a tailored programme created by Nike Global Master Trainer Joslyn Thompson Rule, designed to encourage and inspire women of all abilities. Speaking at Campaign’s Digital Media Strategies event earlier this week, Ella Dolphin, Chief Executive of The Stylist Group, said the launch was “a response to a growing interest in strength training among the brand’s female audience” — a trend she believes will be the brand’s biggest opportunity to engage with its audience on a wider level. “We watch trends closely at Stylist and we have seen a real growth in women strength training – for body, for mind and as a way of reclaiming a traditionally male space,” added Lisa Smosarski, Editor-in-Chief at Stylist. Echoing a number of similar moves made by competitors over the past twelve months, The Stylist Group’s foray into wellness highlights the significant growth opportunity the publishing world is seeing within the $4.2 trillion dollar industry — especially when it comes to experiential propositions. Brands including Well+Good, Women’s Health, Cosmopolitan and Good Housekeeping have all doubled down on wellness-focused experiences recently, with Well+Good launching wellness retreats, Women’s Health UK set to launch its own wellness festival later this year and Good Housekeeping debuting its Good Housekeeping Institute Wellness Lab, a facility in New York designed for testing wellness innovations, products, and fitness programs. Co-Founder of Well+Good Melisse Gelula, recently told Glossy that its events continue to be a growing segment of the business and a chance to connect with readers and consumers offline. Elsewhere, for PopSugar, its experiential wellness initiatives such as collaborations with brands including Adidas, Nordstrom and Samsung currently account for around 11 percent of its total revenue. And with younger generations continuing to drive an experience economy, for Stylist and its peers, their future success rests on their ability to adapt to this change in consumer behaviour. According to The Stylist Group, The first Stylist Strong studio will launch in London this May in members’ club The AllBright, with classes available to both AllBright members and the general public. In addition to classes, Stylist Strong will host events, talks and panel discussions, as well as driving multi-platform content across Stylist’s channels. For some, the brand’s decision to tap into the fitness vertical might come as a surprise, however Dolphin revealed that research of Stylist’s competitors had uncovered that boutique fitness brand Frame mirrored its model more closely than other women’s publications. “They’ve got two million followers on Instagram, they publish like us and it actually was the closest thing to where Stylist was going,” she explained at Campaign’s Digital Media Strategies event. If anything, the move highlights just how powerful of an influence the boutique fitness model and its ability to connect with the modern consumer, has become.